The Tower House is situated a pleasant downhill walk away from the beach with a choice of the road or bush track for the uphill return. Around the corner is Only Fools and Horses' swimming pool with Horse Hire available a little further on. Muriwai, on Auckland's unspoilt wild West Coast, 35 minutes from Downtown Auckland and 50 mins from the Airport, is noted for its Gannet Colony, Golf Course, 30-mile surfing Beach and its proximity to adventure activities in Woodhill Forest and to walks and trails for all abilities. There are tennis courts and two cafes and a dairy. Waimauku and Kumeu are noted for their wineries, wedding venues and restaurants and there are Hot Pools at Helensville. The Tower House has extensive decks and verandahs allowing outdoor living in all but the very worst storms and with numerous bifold doors the house, in fine weather, can be opened to the elements and to the constant activity of the sky and the sea. The third 'bathroom' is outdoors on the back deck. A log fire keeps the house warm in winter. Two-thirds of the house, which measures some 300 sq m, was built as an extension to the original, improved cottage. The house has been used as a family home. The Tower House has been used for retreats, seminars, corporate events and as a film set. The house is particularly well suited for families and groups of families - children are welcome. All sorts of other groups have also stayed. The Tower House aims to provide exceptional value for large numbers. 1. Minimum nights may vary and discounts may not be available on some peak dates of the year. 2. An exit cleaning fee is available. The fee shown on this listing is for a two night stay for up to ten people: it may be more for longer stays and larger groups. 3. Parties are not permitted unless by prior arrangement. 4. The maximum number of people permitted is the number shown on the rental agreement. 5. A rate for a one night stay is available - please ask for a quote. 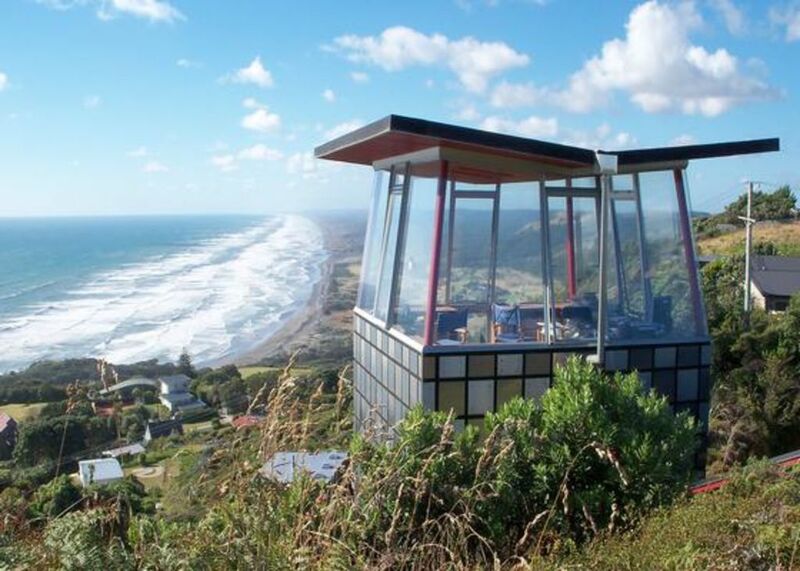 The house, at an elevation of 120m commands spectacular views of Muriwai Beach and the Tasman Sea.